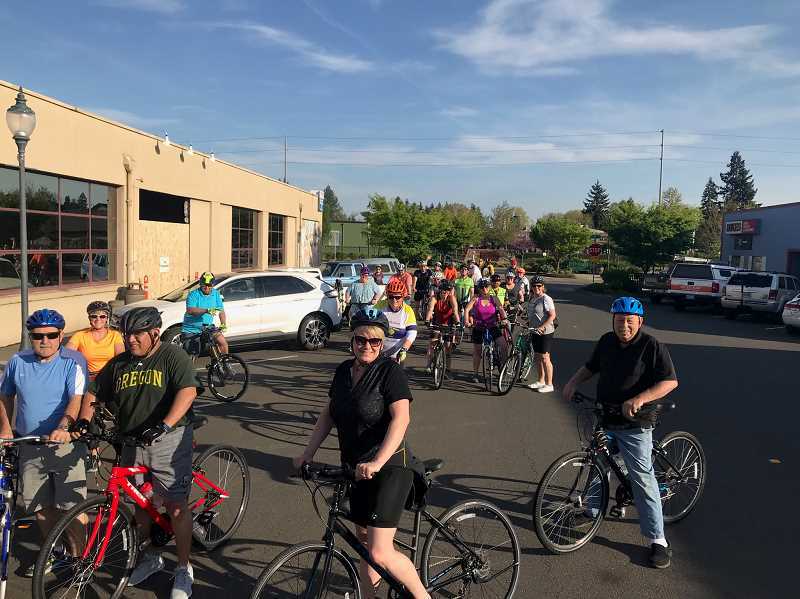 There's a group of at least 30 people who meet at 6 p.m. on Tuesdays at Bikes N More to take an hour out of their busy lives to ride bikes around Canby. This is a group that has stayed mostly the same—only two people have dropped out—to socialize and have fun riding bikes together for the last four years. Tony Tellache, manager of Bikes 'n More started the rides about four years ago to help people learn to "shift gears," he said. He believes that such rides, which last about an hour and aren't designed to force riders on a prolonged, fast, high-millage race, helps people to lose not just weight but also anxiety and hostility while having fun socializing out in the open air. The rides started with six people and have now increased to about 30, sometimes more, sometimes a few less. Only two people haven't continued, he said, one moved away and the other has some medical issues. "We typically have an average of at least 20 people. We ride a little over 10 miles, but it's not the mileage we're looking at, it's the time that promotes healthy living." The ride is designed to be social and keeps at a relaxed pace. "It's for anyone who wants to join. No excuses. You can ride if you're overweight or skinny, slow or fast," Tellache says. On at least a few occasions some of the riders stop for a drink and maybe a sandwich, so the socializing continues after the bike ride. Sometimes there's more and sometimes less riders. For example, during the recent very hot weather, Tellache expected fewer riders because of the heat. Those that want to join are free to meet at the bike store on Tuesdays. If they are afraid they might not be able to keep up, that's part of the beauty of the ride, he says, they aren't there to race. However, he suggests that people who are interested in biking start out doing 45 minutes to an hour three times a week for a month. The next month add 15 minutes to the workout "and people will see, they will start to feel much better. They will also lose some weight, stop snoring and sleep better. Too many people come home from work and plop into a chair to watch re-runs until bedtime," he said, "this is healthier." "Just remember it's all about balance," he said not recognizing his pun. "What you put into it is what you get out of it." Doug Rykken has been "helping Tony out from the beginning. I enjoy it, it's a community event and I've been able to meet and make new friends," he said. "There's a variety of people and skill levels, even families with kids show up. There's a whole range of people and it's a slower ride. Nobody gets left behind." Asked if there were times when he just didn't want to go, he answered yes, "but you have to get motivated. Once you get going it's a positive thing, and it's a healthy option. You feel better, once you're in the habit it's all positive. I think it's a great community asset and brings all kinds of people together. One of Tellache's customers told the Herald that he has yet to join the Tuesday group, but he's thinking about it. Jack Peterson said he likes the idea of social rides and already rides in a Wednesday group and sometimes takes Tellache's "Big Boy Big Girl rides on Thursday night, which are longer—20 to 28 miles—and not necessarily as social. Riders all meet at 6 p.m. at Bikes N More for an hour of fun, health and meeting new people.